Lavallé, Omer. "Canadian Pacific Railway". The Canadian Encyclopedia, 19 March 2018, Historica Canada. https://www.thecanadianencyclopedia.ca/en/article/canadian-pacific-railway. Accessed 18 April 2019. 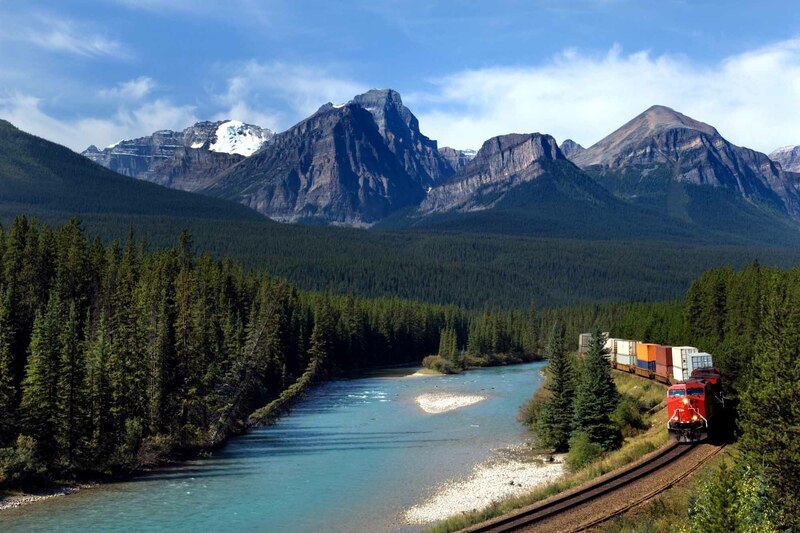 Freight train moving along Bow river in Canadian Rockies. 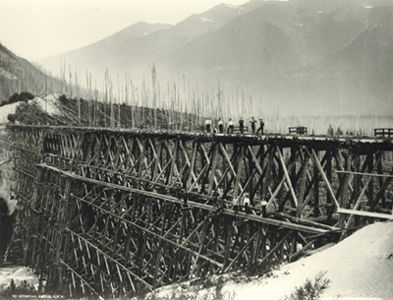 Wooden trestle bridge, CPR (courtesy Vancouver Public Library/31075). In 1870, the newly created nation of Canada acquired Rupert’s Land from the Hudson’s Bay Company, an enormous tract of land stretching north and west; one year later, British Columbia entered Confederation based in part on the promise that a transcontinental railway would connect it to the rest of Canada within 10 years (see Railway History). In order to construct the railway and encourage future settlement, the government considered it necessary to extinguish Aboriginal title to the land (see Indigenous Territory). Bound by the terms of the Royal Proclamation, Canada was responsible for the protection of its Indigenous people and promised to preserve their rights to unceded traditional territories. Numbered Treaties 1 to 7, concluded between 1871 and 1877, solidified Canada’s claim to lands north of the United States–Canada border, enabled the construction of a national railway and opened the lands of the North-West Territories to agricultural settlement. In exchange for their traditional territory, government negotiators made various promises to Indigenous peoples — both orally and in the written texts of the treaties — including special rights to treaty lands and the distribution of cash payments, hunting and fishing tools, farming supplies, and the like. These terms of agreement are controversial and contested. To this day, the Numbered Treaties have ongoing legal and socioeconomic impacts on Indigenous communities. Competition for the lucrative contract for the railway was bitter, and in 1872, shipping magnate and railway promoter Sir Hugh Allan was awarded the charter. However, Allan had also contributed around $350,000 to the Conservative party’s election campaign — when this became public knowledge in 1873, Sir John A. Macdonald's government was forced to resign (see Pacific Scandal). These terms were loudly denounced by opposing interests at the time and remained contentious with the development of the Prairie West. 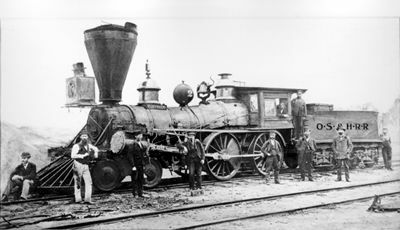 However, in the face of American expansion westward, Macdonald and the federal Conservatives considered completion of the railway a national imperative. Portrait 1901 (courtesy Notman Photographic Archives/McCord Museum). Under the management of W.C. Van Horne, construction was rapidly pressed across the plains. Sandford Fleming had recommended a route through the Yellowhead Pass but a more southerly route through Kicking Horse Pass was decided upon late in 1881. 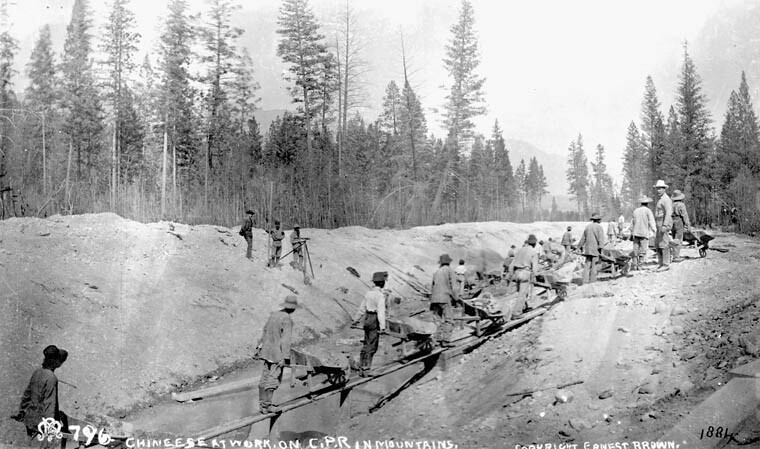 Construction through the rock and muskeg of the Canadian Shield almost equalled in difficulty the engineering feats of construction through the mountains of British Columbia. Chinese men work on the Canadian Pacific Railway in British Columbia, 1884 (Image: Boorne & May/Library and Archives Canada, C-006686B). Chinese camp (Canadian Pacific Railway), Kamloops, BC, 1886. The line through to the Pacific coast was completed on 7 November 1885 with the driving of the "​Last Spike" at Craigellachie in Eagle Pass, British Columbia. 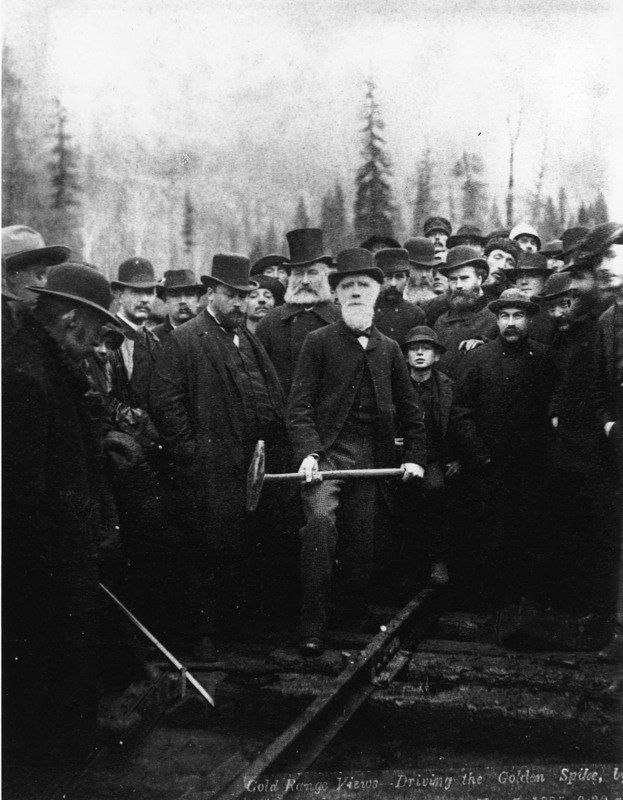 Donald A. Smith at the ceremony marking the last spike to be driven into the Canadian Pacific Railway on 7 November 1885. 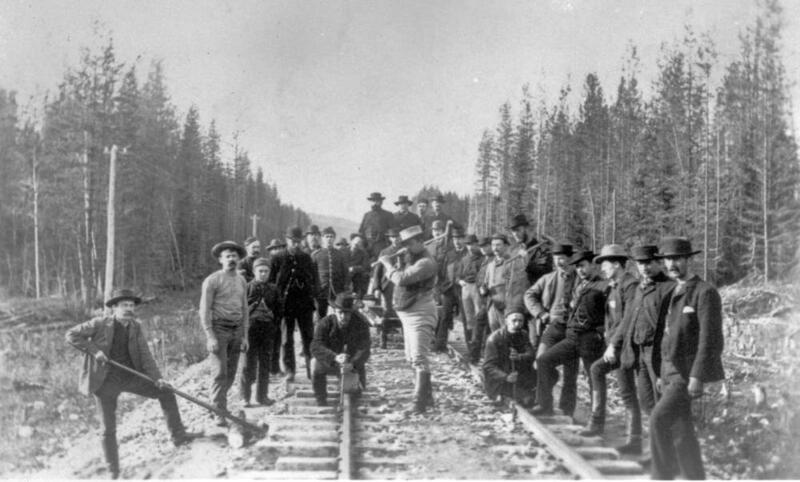 Canadian Pacific Railway employees, waiting for the train to take them east, pose near Donald, BC, on the day the Last Spike was driven on the CPR, 7 November 1885. 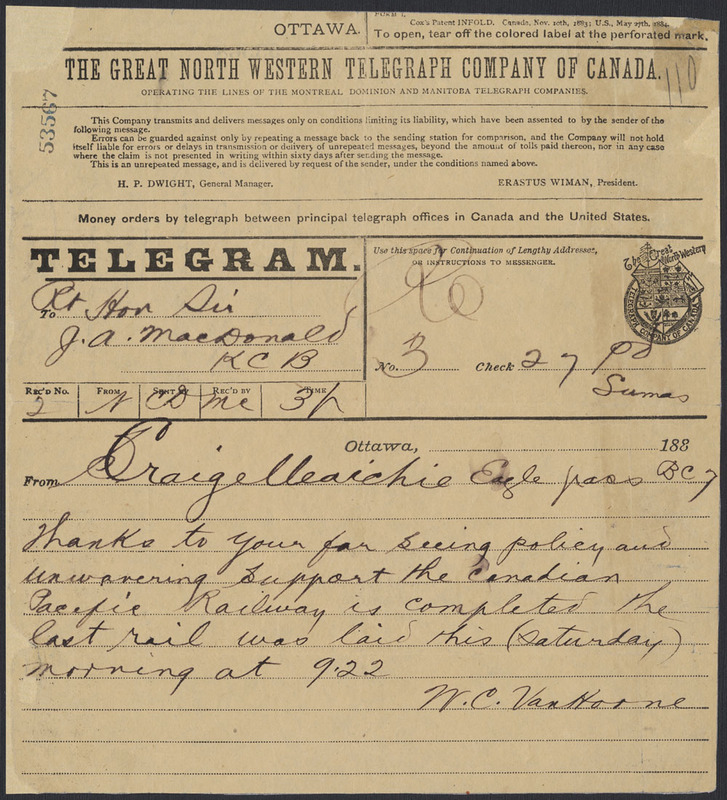 Telegram to Prime Minister Sir John A. Macdonald announcing the completion of the Canadian Pacific Railway, 8 November 1885. The section from Callander to Port Arthur (Thunder Bay), Ontario, was used to move troops westward during the North-West Rebellion, though it was not quite complete. The first through passenger train left Montréal on 28 June 1886 and arrived at Port Moody, British Columbia, on 4 July. During construction, the CPR became involved in the sale and settlement of land (1881), acquisition of the Dominion Express Company (1882) and the acceptance of commercial telegraph messages (1882). The company provided its own sleeping and dining cars on trains and constructed tourist hotels (e.g., at Lake Louise, Alberta) and dining halls along the route in the western mountains. This foothold on the tourist industry benefited the CPR later in its international development of hotels, steamships and airlines (see Hotel; Tourism). Following construction, the greatest challenge facing the CPR was to develop business to make the line self-sustaining. Though settlement proceeded rapidly in the wake of the rail lines, population in western Canada was insufficient to sustain the line fully for many years. To increase business, the corporation became very active in promoting trade in the Pacific. 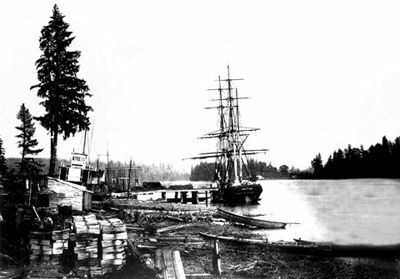 Within days of the arrival of the first train on the west coast in 1886, sailing vessels chartered by the CPR began to arrive from Japan, bringing tea, silk and curios. By 1891, the company had secured a contract from the British government to carry the imperial mails from Hong Kong to Britain via Canada. The result was the purchase of three ocean passenger-cargo vessels, forerunners of the present-day fleet. By 1900, the mountain hotel system had expanded into the major cities, led by the Hotel Vancouver (1887), Québec's Château Frontenac (1893) and Montréal's Place Viger (1898). Other services expanded simultaneously. A line was opened (1889) across northern Maine from Montréal to Saint John, giving the CPR direct access to an all-weather Atlantic port. Attempts to capture traffic from the western American states were made with construction of a line to North Dakota (1893) and control (which remains today) of what is now the Soo Line Railroad Company in the United States. Branch lines were greatly extended to feed traffic to the East-West main line. 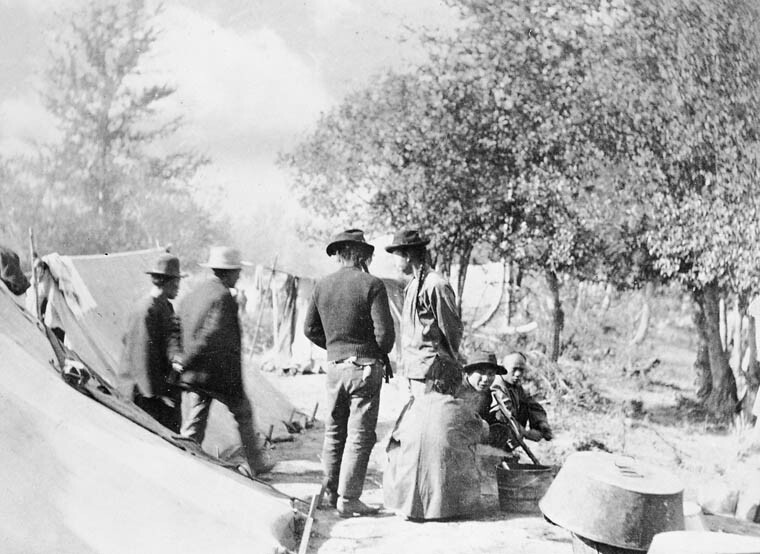 Rapid settlement followed construction of branches in southern Manitoba, in Saskatchewan from Regina to Prince Albert (1890), and in Alberta from Calgary North to Strathcona (Edmonton) in 1891. Expansion into the Kootenay mining region of southern British Columbia (1898) involved the acquisition of a railway charter that included a smelter at Trail, BC. This was the nucleus of the CPR's involvement in mining and metallurgy, formalized by the formation of Cominco Limited in 1906, a CP-controlled company (in 2001, Cominco was acquired by Teck, another mining company). The CPR’s Pacific fleet was improved and, in 1903, the company purchased the Beaver Line shipping company and opened service in the North Atlantic. In 1909, CPR purchased the long-established Allan Line, and formed Canadian Pacific Ocean Services in 1914–5 (after 1921, Canadian Pacific Steamships Limited). Between 1899 and 1913, the CPR increased its trackage from approximately 11,200 km to 17,600 km. More than half of the new track was in the Prairie provinces, and it was intended both to provide branch lines into areas of need and to ensure that the CPR would remain competitive in relation to the developing transcontinental lines of the Canadian Northern Railway and the Grand Trunk Pacific Railway. 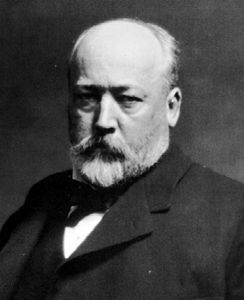 The widespread expansion of the company, much of it under the presidency of T.G. 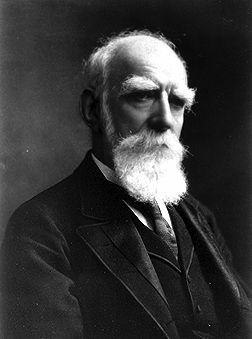 Shaughnessy (1899-1918), placed a heavy drain on company resources, but continuance of the National Policy, with its substantial tariffs, meant continuing high freight rates in the West. Attacks on these rates in 1896 helped to bring about the defeat of the Conservatives. The Liberals reduced rates with the Crow's Nest Pass Agreement in 1897 and, under the Manitoba Grain Act of 1900, required railways to provide loading platforms for farmers. In addition, charters were granted to the Canadian Northern Railway to develop the huge area of northern prairie left vacant by the CPR. Canadian National Railway (CNR), formed by the government of Canada between 1917 and 1923, was a major challenge. The CNR consolidated the failing Grand Trunk Pacific, Canadian Northern, Intercolonial and Canadian Government Railways, and competed with the CPR in hotels, telegraphs, steamships and express services as well as railway services. Despite this massive, government-supported competition, CPR survived as a commercial enterprise. During the Second World War it provided not only transportation, but also the production of armaments and materiel in its own shops. During the conflict, much of its merchant fleet was commandeered for military transport purposes, resulting in the loss of 12 vessels. Canadian Pacific Air Lines (later CP Air) was organized in 1942 with the purchase of Grant McConachie's Yukon Southern Air Transport and numerous other flying concerns. Under McConachie's leadership after 1947, CPA developed into an international carrier serving the Far East, Australasia, most of South America and several European countries (see Aviation). In 1987, CP Air was acquired by Pacific Western and the two companies began operations as Canadian Airlines International (CAI). It was later expanded with the purchase of Wardair. A rigorously competitive market and government regulation caused significant changes to the airline industry in the 1990s. CAI was taken over by Air Canada in 2000. Until the late 1950s, CP's diverse interests were looked upon as ancillary to the rail system. Beginning around this time, management embraced a policy of full diversification by making each operation fully self-supporting. Thus, operations that had been handled by specific departments in the railway corporate structure were set up as enterprises in their own right; e.g., Marathon Realty Co Ltd (1963), which took over the administration of real estate other than that required for railway use; CP Hotels Ltd (1965); and CP Oil & Gas Ltd (1958), which later became PanCanadian Energy Corporation. Non-transportation interests were vested in a holding company, Canadian Pacific Enterprises Limited, founded in 1962, leaving the railway, air, ship and highway transportation fields under the jurisdiction of the parent company. In 1968, a new corporate identity program gave the names CP Rail, CP Ships, CP Transport and CP Air to the various transportation modes. In 1967, the communications wing was integrated, along with CN's parallel organization, into a new, jointly owned company known as CNCP Telecommunications Ltd. (In 1990, CNCP became Unitel Communications, which was later sold to other communications providers). In 1971, to reflect its broader orientation, the company’s original name was altered to Canadian Pacific Limited (CPL). In 1996, the company was restructured, with Canadian Pacific Railway becoming a subsidiary of the company rather than a division (in effect, CPR would operate independently, with no cross-subsidies from the other divisions). The company also sold a number of its enterprises, including Marathon Realty (1996) and its interest in Laidlaw Inc. (1997). In 2001, the company separated into five independent companies: Canadian Pacific Railway, CP Ships, PanCanadian Energy Corporation, Fording Coal and Canadian Pacific Hotels (renamed Fairmont Hotels & Resorts Inc.). The restructuring meant that CPR was once again purely a rail company. PanCanadian merged with the Alberta Energy Company Limited in 2002 to become ​Encana, one of the world’s leading energy producers, while CP Ships was sold to a German conglomerate in 2005, becoming part of the Hapag-Lloyd shipping company. Fording Coal was purchased in 2008 by Teck Cominco. Pierre Berton, The National Dream (1970) and The Last Spike (1971); J.M. Gibbon, Steel of Empire: The Romantic History of the Canadian Pacific, the Northwest Passage of Today (1935); H.A. Innis, A History of the Canadian Pacific Railway (1923); W. Kaye Lamb, History of the Canadian Pacific Railway (1977); J.L. McDougall, Canadian Pacific: A Brief History (1968); Tom Murray, Rails Across Canada: The History of Canadian Pacific and Canadian National Railways (2011). 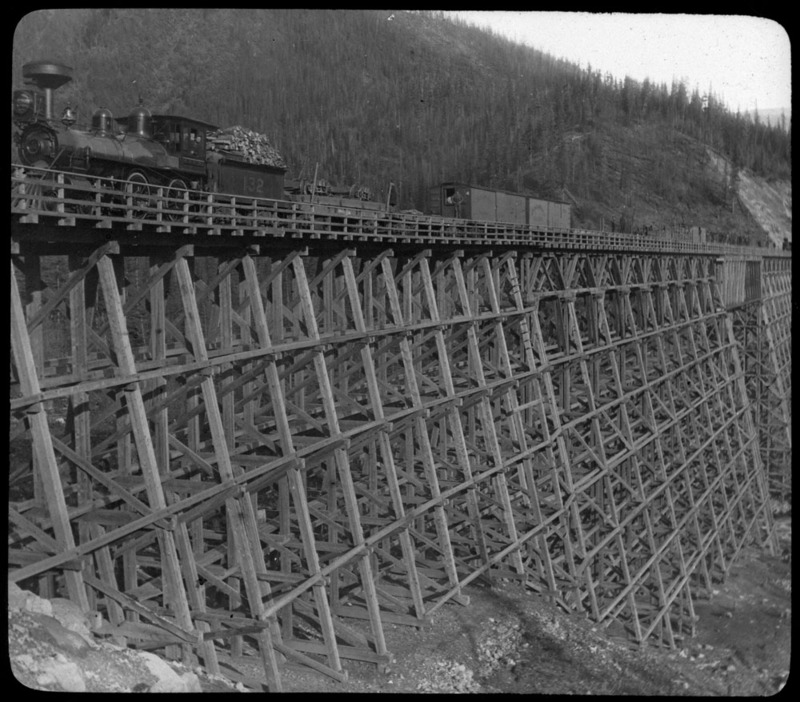 The Canadian Pacific Railway CollectionOnline gallery of digitized photographs depicting railway construction in British Columbia and the arrival of CPR trains and ships in Vancouver. From the Vancouver Public Library. NitroA Heritage Minute about the Chinese people who came to British Columbia in 1882 to work on the final link of the Canadian Pacific Railway. From Historica Canada. See also related learning materials. Sir Sandford FlemingAn illustrated history of the life and times of Sir Sandford Fleming. A Virtual Museum of Canada website. Atlas of Alberta RailwaysExtensive online collection of maps, documents, and images pertaining to the major railways that criss-crossed Alberta since the early days of train travel. From the University of Alberta. The Ties That BindThis site documents the history of the Chinese Canadian community. Includes stories about the men who came from China to build the transcontinental railroad in the 1880s.